What is this crazy sounding ailment known as plantar fasciitis? No, it’s not a fancy name for a plant in your garden. It’s a type of foot pain characterized by inflammation. The inflamed portion of your foot is known as the plantar fascia (hence the crazy name) and can cause pain from your toes to your heel and back again. Because plantar fasciitis is a common injury in athletes, it’s often treated under sports medicine. However, anyone can suffer from this type of foot pain, so it’s best to receive treatment recommendations from a medical professional. Pain from plantar fasciitis is often referred to as stabbing and will likely continue to get worse if left undiagnosed and untreated. In other words, you need to seek help from a medical professional if you suspect an injury to your plantar fascia. Diagnosis and treatment can be easier if you pay close attention to your symptoms, including where you feel pain, how severe the pain is, what times of day the pain is worse, and which activities can cause symptoms to occur. In many cases, this particular type of foot pain is categorized as chronic. Chronic plantar fasciitis can lead to pain in other parts of your body, including your back, knees, or hips. But don’t worry. Just because it’s chronic doesn’t mean it’s unmanageable. To help manage chronic plantar fasciitis that is not helped by the treatments recommended above, you may need to get steroid shots, help from a physical therapist, or in very extreme cases, surgery. 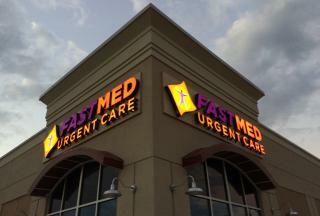 If you need to see a specialist, a medical professional at FastMed Urgent Care can make the appointment for you and forward your digital medical records. Don’t suffer needlessly with pain from plantar fasciitis. Get a proper diagnosis and treatment recommendations from a FastMed clinic near you.